Above: A sampling of Labovitz's scrolls, created in collaboration with people from five cities around the world. All photos by Alicia Eler. Duluth-born, Twin Cities-based artist Anne Labovitz isn’t detoured by borders or language barriers. Rather, she’s thrilled about them. 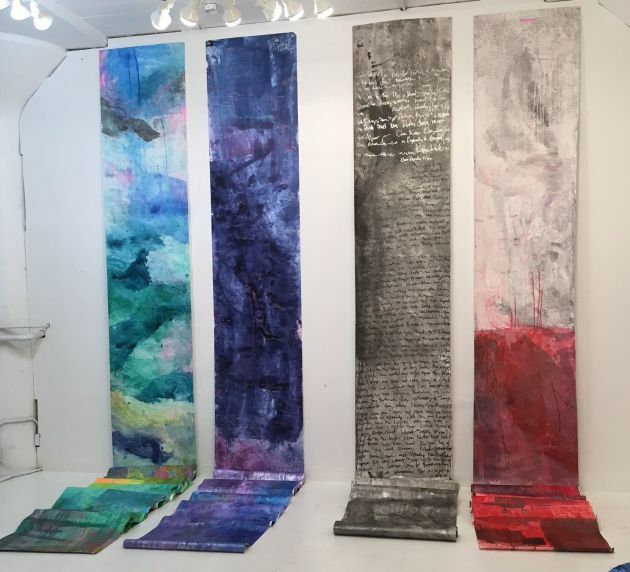 For her current exhibition “122 Conversations: Person to Person, Art Beyond Borders,” on view at the Tweed Museum of Art in Duluth through Jan 6, 2019, she showcases her love of connection by creating large-scale scrolls that she created through conversations with people around the world. She took to Skype and good old-fashioned face-to-face conversations to learn about people from Duluth’s five sister cities — Petrozavodsk, Russia; Rania, Iraqi Kurdistan; Växjö, Sweden; Thunder Bay, Canada; and Ohara Isumi-City, Japan — and then transformed those collaborations into long, flowing scrolls that can be hung from walls. For Labovitz, it doesn’t necessarily matter if she met the person or not – it is more about the connection they made through conversation, and the art that she generated from that. Previous to this work, Labovitz was creating portraits using woodcut with acrylic and pastel on canvas. We sat down face-to-face in her St. Paul studio to talk about how she got into this project. 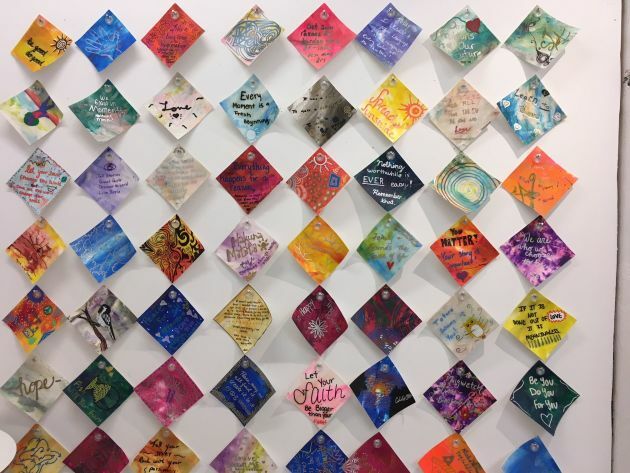 Alicia Eler: What is your interest in using art to connect people? Your paintings are really a collaborative exercise with the people you interviewed in different cities around the world. Anne Labovitz: I grew up in Duluth, and Duluth is geographically isolated even though it’s got an international port. I lived abroad in Hanover, Germany, and Zurich, Switzerland, and I finished my graduate degree in Berlin. The project came out of my love for international. Duluth just doesn’t have a lot of diversity the way – in terms of religion, cultures and large other differences that you would like to expose yourself to or be friends with. So I thought this would be an interesting way to humanize people in the other countries as well as the Duluth folks to people in other countries. AE: Was there something else beyond your love of travel that inspired you? AL: Yes, that in combination with my grandmother, who was an artist/refugee herself – she came from Lithuania. She was pretty eccentric and talked about Martin Buber’s philosophy of “I/Thou” extensively. She was an artist and she was really my person on the planet. She saved me from myself when I had difficulty as a teenager — I was in treatment — and she loved me through letter writing. So there was a history of letter writing and that connects with the work, but it also connects to this Buber idea of when you see someone, whether you meet them or you just pass them in the train station, everything else melts away and you have some sort of a human connection. AE: After interviewing people in these various cities, either in person or via Skype, how did you come up with these very visual, painterly scrolls of bright colors and some text in English written on them as the final product, or the artwork? AL: It was sort of this endeavor to find that in the people I interviewed, and then [I wanted] to give that visually in a way to the communities. Each country got its own separate exhibition. So it is like a present almost. I sent the paintings to each city in a white bag in a suitcase. Everything fits inside that, under 45 pounds, even though you have 14 of these gigantic things that come scrolling out. Like Mary Poppins. My intention was that you feel like, as a recipient, warmth and a sense of belonging and excitement, having opened the bag and being interviewed. AE: Were there any experiences that especially moved you? AL: People were very motivated to connect with someone and be a part of a project. The village in Iraq was the first. What was amazing was they just, they too are isolated – they were eager to connect and be a part of a community. At the time they were a new sister city, only two years. So it was outstanding to talk to them. They are freedom fighters so they are all fighting ISIS. They are major radicals. I spoke with the mayor and that was an hour-and-a-half interview because he kept being like ‘so you have more questions?’ He didn’t want to stop. I spoke with a gentleman who runs two mosques and has three wives and 24 children – and I didn’t flinch, which is a really good thing. A couple of the women there run a school for the orphaned kids from the next village whose parents have all been murdered by ISIS. And then one time you are talking to someone and someone’s brother has to go to the front line and you’re like ‘OK let me know, I hope he comes back.’ Just a really intensive experience they are having. They hoped for freedom, and they hoped that their children would finish their education. In Kurdistan they couldn’t hope for peace, they had to hope for freedom because that comes first. So that really hit me hard. Above: Additional collaborative artworks made with Labovitz.